I often day dream. Always about stupendously impossible things. Like beating Chuck Norris in a martial arts tournament whilst my eight pack abs glisten in the setting sun. Or abseiling into the set of Countdown and rescuing a buxom Carol Vorderman from the evil clutches of Richard Whiteley whilst he sits in his evil chair stroking an evil white cat. I’ve nothing against private ambulance organisations. They have a job to do as much as anyone. The theory goes that they end up “scabbing” work from the main Ambulance Service which, in turn, causes resentment. But at the end of the day, a job’s a job. My own personal view stems from something a little more simple and naive – I believe the work the LAS does, on a whole is excellent. I fear that people look at a truck with the words “Ambulance” on it and club them all into one big organisation, not realising that there are private organisations out there trying to do similar work but who have nothing to do with the LAS. I always thought an Ambulance was an Ambulance – all run by the same people. 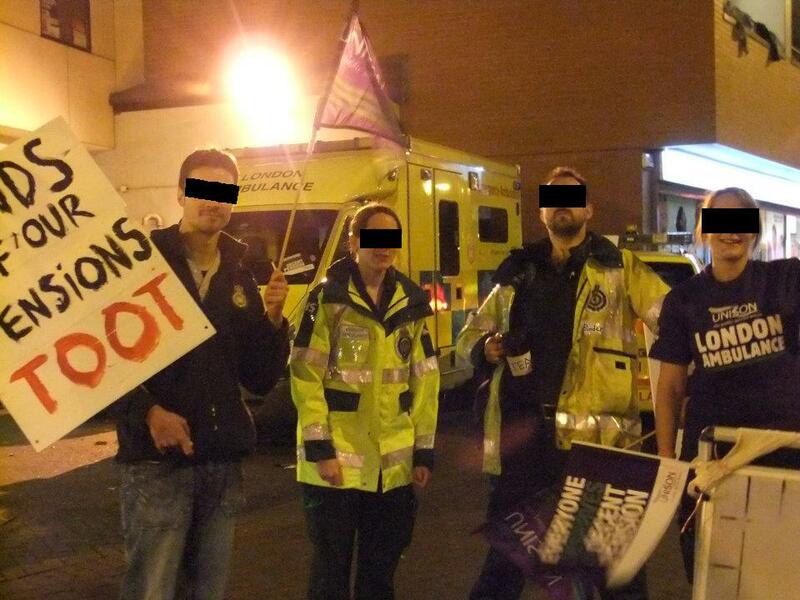 So, the fear goes that if a private ambulance crew do something bad we (the LAS) get blamed for it. You aren’t called a Paramedic crew on the or the radio. Instead you are referred to as a “Hotel” crew. At the beginning of your shift Control want to know what skill level you are – so, I would give them the skill level of “Hotel”. Before hand it would have been skill level “Technician”. “Mobile Data Terminal”. Sounds like it should be something mega technical but it isn’t. It’s the on board computer screen that keeps us updated with our jobs. It keeps track of all our times too. This is important for keeping ORCON and keeping the government happy. Strike? Or not to Strike? The LAS went out on strike last Wednesday, being one part of many public service workers to do so. Random strikers with identities protected to protect their identities!